More images of cards from 2010-11 National Treasures Basketball are being released by Panini. 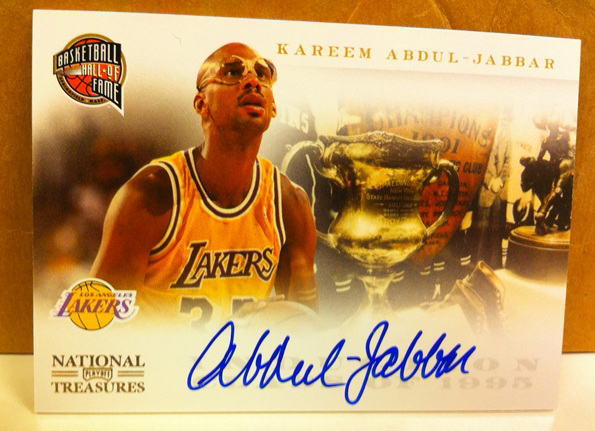 The set won our Sports Card Award last year for the Best Ultra Premium Cards and 2009-10 Panini Hall of Fame Basketball Cards were a personal favorite. For the upcoming release of National Treasures it appears that Panini is combining the two sets. Here is an example. I think this card is fantastic. Sure, it's a great player with a highly desirable autograph but it's the design and layout of the card that makes it visually stunning. There are more examples of the cards that will be included in this set over at The Knight's Lance and if you haven't done so already, check out Panini's newly revamped Facebook page using this link.